People are injured everyday in Modesto and its surrounding areas. Personal injury caused by the negligence or defective products can be life altering to those who are injured. A personal injury case is one where you are the victim of someone or something’s wrongdoing and you are injured. Personal injury cases include but not limited to an injury from a car accident, a dog bite, a slip and fall, a product defect (product liability), or from being assaulted. The key thing for a victim of a personal injury do is to seek immediate medical attention. Quick medical attention might save this victim from a more severe or life threatening injury. Go see the doctor and make sure you are ok. Internal injuries are not easy to see. A “once over” by the doctor is important to determine if you have any permanent or even temporary injuries. Don’t be tough and try to work through the pain. If you are in pain that is your body’s way of telling you that something is wrong. The next thing a victim of an injury should do is speak to an attorney about protecting their rights. An attorney can immediately get you back on balance. Remember; do not speak to the opposing insurance company if you were in an auto accident, unless your attorney tell you to do so. 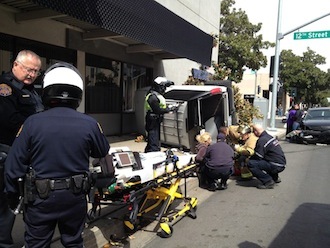 CAN YOU AFFORD A MODESTO PERSONAL INJURY ATTORNEY? Modesto personal injury attorneys at The Bogan Law Firm, A Professional Corporation will not ask you for any attorney fees, unless we are successful in gathering money for your injury. We take a percentage of what you recover. No fees unless we collect money – this is also known as a contingency fee. This is not a special or unique arrangement. Almost all personal injury lawyers offer this type of fee arrangement. There are various names that are used for this arrangement, but ultimately it is nothing special. Many times attorneys will take up television, radio, or billboard space screaming that they won’t charge you a fee unless they win. Again, this should not be a determining factor when hiring an attorney – most all attorneys offer the same arraignment. At The Bogan Law Firm, A Professional Corporation, if we commit to taking your case, then we only get paid if we win or settle your case to your satisfaction. We can take a case on an hourly basis, but most of our clients prefer the contingency method of payment. Tai C. Bogan has a stellar reputation in the legal community. He is highly rated by independent attorney rating services. In addition, he has been nationally recognized as a trial attorney for his work in the Modesto and Stockton area. The associates working for the law firm are well respected and have the necessary experience to help in your case. Although the firm prides itself on being aggressive when fighting for your recovery, we are also compassionate about the process. We want to assist in your recovery and make sure you are stable both emotionally and physically before filing a lawsuit. We are experienced negotiators who can oftentimes settle your case without contentious litigation. However, we are not afraid of litigation and taking your case to trial where it makes sense for you. Do we have to prove this was someone’s fault? Some personal injury cases do not require the attorney prove it was someone else’s fault and in other cases we do. For example, almost always when a dog bites someone, the dog’s owner is “strictly liable” for the injury caused by the dog. That means that even if the dog was a docile calm animal, if it bites someone, the owner has to pay for damages. On the other hand in a car accident, the attorney would need to prove that the other driver was negligent. In other words that other driver to the accident was negligent. In other words the other driver failed to exercise the care that a reasonably prudent person would in the same or similar circumstances. If we have to prove fault, then how do we prove fault? We usually prove fault by the use of evidence, combined with the law. Evidence includes things like eye witnesses, documents, pictures, expert and lay opinion. The law may make some presumptions or rules that we can follow in order to prove fault. We obtain that evidence by taking witness statements, through the discovery process, through depositions and subpoenas. We also hire experts where appropriate. Is our client injured and if so to what extent? Whether the person is injured is usually pretty easy. However the extent of that injury is more complex. It may take weeks or even months for doctors to make an evaluation as to the exact extent of injuries. For example in a dog bite case, what are the short term and long term injuries? Scarring for example, how will it look over time, do the scars hurt; are the scars noticeable, can they be removed? What about a traumatic brain injury? A simple blow to the head can cause permanent long lasting effects on a person. Unless a proper medical evaluation is done, that person may never know the extent of their injuries. Does the party whom we a thinking about suing have insurance coverage or some other method of payment? At The Bogan Law Firm, A Professional Corporation, we want to maximize the amount you collect for your injuries. It is important that before going into a legal battle that you want to know whether someone has enough money to cover your damages. That might be the person's insurance that hurt you. That might be your own uninsured motorist policy. You want to know this too before you put forth any effort to sue another person when they may not ever be able to make you whole again. Almost always, the lawsuit is paid for or covered by some sort of insurance that is carried by the person who hurt you. If the person who hurt you was working at the time of the accident or injury, that person’s employer may be liable for the injury as well. We offer a free initial consultation for Modesto area personal injury cases. Attorneys in our office are ready to answer questions you might have about your personal injury case. Contact us today at 209-565-3425. Or fill out an online request here.